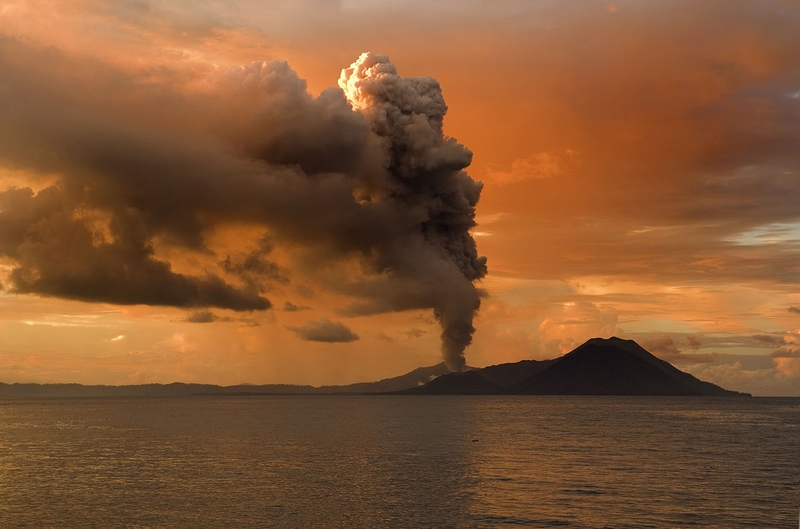 Rabaul, a township on the northern tip of Papua New Guinea’s New Britain island, is still covered in the ash of a volcano that exploded decades ago. Eruptions have twice decimated the city, once in 1937, and once in 1994. Both times, locals rebuilt and soldiered on. Today, if you’re driving across Rabaul, you’ll pass long stretches where ash is still piled on the shoulder and even on the middle of the road; it’s so thick you’ll want to close the windows to keep the dust from filling the car. That volcano violently decimated the island’s then-major industry—tourism has yet to fully recover, over 20 years later—but it may yet become the bedrock of another one. The only issue is, that industry doesn’t actually exist yet. And some environmentalists, scientists and activists hope it never does. Here in Papua New Guinea, one well-financed, first-mover company is about to pioneer deep sea mining. And that will mean dispatching a fleet of giant remote-operated robotic miners 5,000 feet below the surface to harvest the riches scattered across ocean floor. These mammoth underwater vehicles look like they’ve been hauled off the set of a sci-fi film—think Avatar meets The Abyss. And they’ll be dredging up copper, gold, and other valuable minerals, far beneath the gaze of human eyes. It’s a little-watched but fast-approaching milestone that raises serious questions about the future of consumption in our rapidly modernizing, mineral-hungry world: How deep are we willing to dive to get the materials that make our electronics run? The idea of razing the barely-studied deep sea floor has many nervous—from locals who worry about an accident, to scientists who fear we may be destroying an ecosystem we don’t yet understand. But as crucial materials like copper grow scarcer, might mining the deep, far away from human populations, be a reasonable endeavor? Or should the mere fact that we’re poised to roll over the ocean floor with robotic harvesters be cause enough to take pause and reassess the sustainability of our thirst for the metals that shape modern life? Regardless, the first deep sea mine is slated to begin operations in just over two years, at a site called Solwara-1, leased from the Papua New Guinean government. It’s just off the coast of Rabaul, at the watery foot of that active volcano. Like, say, nuclear fusion, seafloor mining is a high-tech promise that has been attracting serious investment, winning sporadic headlines, and lingering on the cusp of becoming a reality for about half a century. But in 2018, a Canadian company called Nautilus claims it will begin to do what no one else has been able to: Actually mine the deep. Johnston is hinting at nothing short of a deep sea gold rush, and he’s far from the first. In fact, the original spree commenced almost exactly half a century ago. The quest to mine the ocean floor began in earnest in 1965, when John L. Mero, a shipyard consultant formerly with UC Berkeley’s Institute of Marine Resources, published Mineral Resources of the Sea. 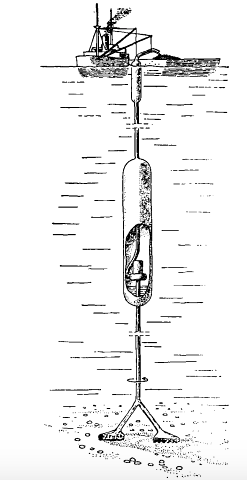 In that volume, Mero wrote that “the sea is a major storehouse for the minerals that serve as the foundations of an industrial society” and claimed riches like nickel, cobalt, and copper lay on the bottom of the ocean in manganese nodules—metal-rich clumps—awaiting extraction in near-limitless supply. Following the publication of Mineral Resources, nations including the United States, France, and Germany set out to explore the deep in search of these clusters of oceanic riches. Over the subsequent decades, nations sunk hundreds of millions of dollars into deep ocean mining, to little avail. A 2000 study published in Science found that a total of $650 million had been invested in the enterprise, much of it before metal prices collapsed during the recession caused by the 1973 oil crisis, and before deep sea scientists realized that Mero’s projections of abundant riches were hopelessly optimistic. For decades, deep sea mining was mostly abandoned, and the dream of scooping riches out of the ocean depths lay idle. In recent years, however, two trends have converged to help renew interest in the concept: Growing global demand for the recoverable metals, especially copper, has upped the profit potential for deep sea mining. Copper is crucial to modern life; it’s both malleable and a great conductor, so it’s found in consumer electronics, cables, cars, refrigerators and beyond—and its value is exploding as major economies like China and India industrialize. The undersea regions that would play host to the mines bear loads of other minerals essential to modernity, too, including nickel, silver, gold and cobalt. 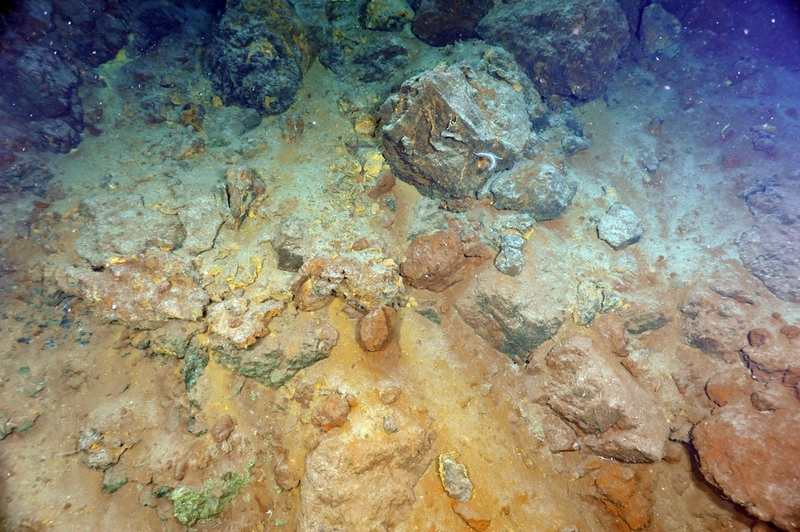 Finally, a better understanding of deep sea geology has spurred new-wave prospectors to shift their focus from the manganese nodules of yore to another target: Sulfide deposits that form near hydrothermal vents. Nautilus is just one of the outfits hoping to take advantage of the trends pushing deep sea mining closer to reality—both Japan and Korea are exploring the idea and developing tech to mine in their waters, and another private company, Neptune, has staked out some major leases to do the same in the Pacific. However, as the idea has grown closer to fruition, it’s also attracted its fair share of worry. In 2007, the major journal Science published an article called the “Danger of Deep Sea Mining,” which voiced concerns that the huge, swirling sediment plumes stirred up by underwater mining could disturb habitats, and that the process could have a toxic effect on the water column. It concluded that “Plans for deep-sea mining could pose a serious threat to marine ecosystems.” Meanwhile, one of the most alien and intriguing ecosystems on earth is also a key fixture of the mining operations: Hydrothermal vents. 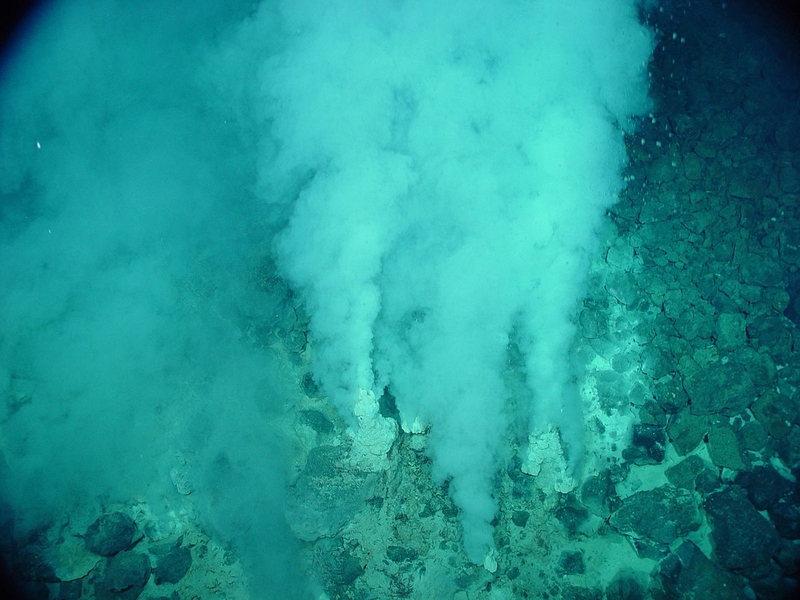 These hydrothermal vents are found in on seabeds near active volcanoes, like the one that forms the atoll around Solwara-1, and the one that Rabaul sits atop. Some scientists have posited that life itself may have originated near their exhaust, where heated, mineral-rich seawater blasts out of the oceans crust into the stark, cold waters of the deep. But here’s why miners are so interested in them: They are constantly, if very slowly, creating what geologists call seafloor massive sulfides. “These deposits form at or near the seafloor where circulating hydrothermal fluids driven by magmatic heat are quenched through mixing with bottom waters or pore-waters in near-seafloor lithologies,” the US Geological Survey explains. The deposits occur in broad, flat, lens-like bodies that lay parallel to the volcanic bedding. “Massive sulfide lenses vary widely in shape and size and may be podlike or sheetlike,” the USGS notes. These deposits are often rich in valuable minerals like copper and gold, and happen to be easier to find, too. Nautilus plans to harvest the spots where these materials accumulate—while avoiding the vents themselves—to bring the minerals to the surface en masse, and, of course, sell them for profit. “The seafloor massive sulfides are copper-rich, and they have higher copper content than what remains on land in known reserves, so they’re attractive in that sense,” Cindy van Dover tells me. Van Dover is a deep sea scientist with Duke University, and has served as a science advisor for Nautilus—she is not a paid consultant. Van Dover was recently invited down to Papua New Guinea by TED, the “ideas worth spreading” nonprofit, which had organized a seafaring expedition to tackle ocean issues. She was asked to give a talk about deep sea mining aboard the National Geographic Orion, as it cruised over the tropical waters soon to be worked by Nautilus. The consummate scientist, Van Dover is methodical and cautious in her thinking about the subject. She’s soft-spoken but easy to smile, has graying, close-cropped hair, and, over the course of our talks aboard the boat, she exuded a quiet ambivalence over the mining question. Which makes sense, because she’s spent her entire three-decade career studying the deep sea ecosystems it threatens to transform. “I started studying these hydrothermal vents in 1982,” she told me, while the boat’s gently rocking deck churned my stomach. “They were discovered in 1979. So yeah, hearing someone was going to rip them up? Cut them up and destroy them?” she added, shaking her head. Of course she was concerned. “There are animals living at these active hot springs,” she says. “So, we’re really interested in seeing what the impact on those communities will be.” Life that gathers around hydrothermal vents is often surprisingly vibrant; it can include tube worms, sea snails, blind shrimp, and deepwater fish. Out the window of our cabin on the Orion, pillars of smoke rise in the distance, a product of the region’s slash-and-burn agriculture practices—a constant reminder that Papua New Guinea is poor, and that mineral royalties could go a long way. Van Dover takes pains to note that Nautilus isn’t about to swiftly and surreptitiously mine an out-of-the-way environment under the cover of darkness. Quite the opposite, she says. The company came to her and asked for her expertise, and has since been unusually transparent and proactive. “They would ask very direct questions: So what are you concerned about?” she said. “If we take this one site away [ie, destroy Solwara-1], won’t [life] come back?” And that is exactly what Van Dover is concerned about: The ecosystems poised for destruction. Here’s another interesting thing about those habitats, and the animals that live in them—they get destroyed, fairly routinely, already. Unlike East Pacific Rise, however, Solwara-1 is a longer-lived site, meaning volcanic flows come much less often, and don’t destroy the habitats on the seafloor as regularly. These are the creatures that risk getting wiped out by Nautilus, too. At Solwara-1, some scientists worry that the animals might not have time to recover. Other scientists point out that this complex ecosystem is simply still poorly understood—we might have little idea what to expect if they’re mined. Nautilus, meanwhile, says that it would proceed responsibly, and emphasizes the serious economic case for mining. 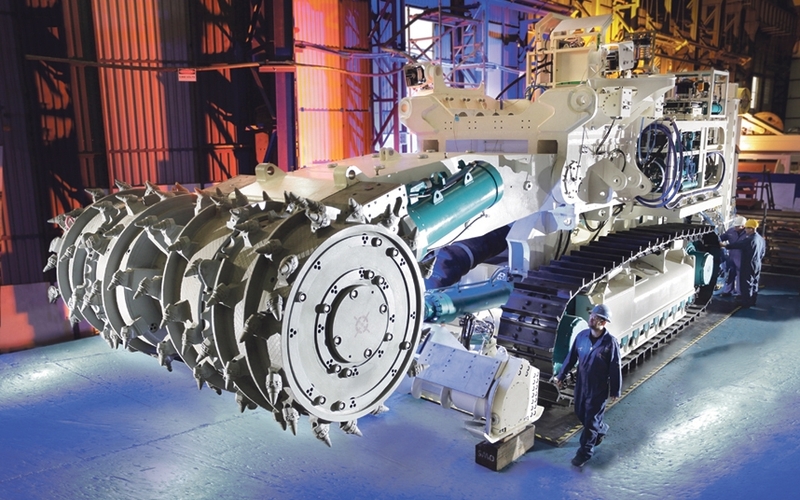 Furthermore, aside from the fact that the targeted mining grounds lay 5,000 feet below sea level, there are parts of deep sea mining that are actually easier than on-land mining. Hold tight: We’re going to get wonky with some mining jargon for a second. “The seafloor massive sulfides that Nautilus is interested in are sit proud on the seafloor so they have no soil or sediment overburden—the overburden is water,” van Dover says. Overburden is the layer of rock or soil overlying a mineral deposit, and “sit proud” means, in mining speak, to “sit on top of.” That means there’s no obtrusive layer of land to peel away before you can start collecting your valuables; they’re sitting right there on the surface, ripe for the picking. Of course, that surface is the ocean floor, thousands of feet below sea level, which means Nautilus will need an elaborate, high-tech system to efficiently extract its prizes. And here’s where things start to get sci-fi. According to its public blueprints, the Nautilus plan involves three separate robotic, remotely-operated vehicles working in tandem to prepare, mine, and collect the minerals from the deep. Each is about 50 feet long, 15 feet wide, and way [sic] up to 340 tons. Built by the English remote vehicle manufacturer SMD, with US heavy machinery maker Caterpillar, together, the fleet is worth $100 million. Each of them will be deployed from a giant ship, the Production Support Vessel, that will float above the mining operation like an oil rig. After the material has been extracted, the Collecting Machine is sent in. 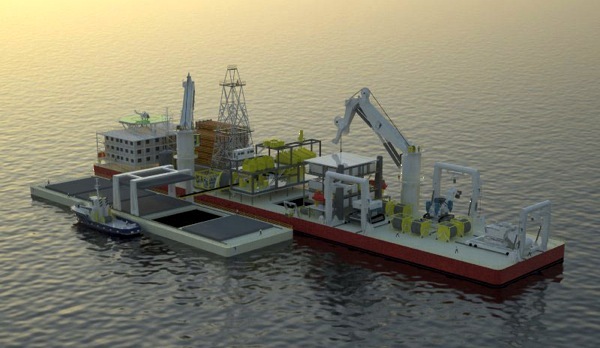 That machine “will collect the cut material by drawing it in as seawater slurry with internal pumps and push it through a flexible pipe to the riser and lifting system,” which will in turn pump that slurry to the surface. Onboard, the slurry is dewatered and the desirable solids are stored in the hull, where they await transport from yet another vessel. Each of these robots can be remotely operated from above the surface, and are built to withstand the immense pressure of the deep. But as Nautilus notes, they’re mostly adapted variations of extraction tech currently used on land to clear land away for coal and ore. Just underwater—deep, deep underwater—and with robots. All told, it’s a complex, high-tech, and high-risk undertaking. The process is carried out in an extreme environment, and if those robots break down, repairs will be costly, as sending down a submersible to such depths would no doubt pose a challenge. And an accident, in such a high-stakes situation, stands not just to pollute the local environment. As such, Nautilus has made a lot of people nervous. Local protests against the mine have been rising up in Rabaul, led by concerned New Guineans, van Dover tells me. As we’re driving through the city’s ash-pocked roads in a bus, she asks a local tour guide if she’s seen the protests. “Oh yes,” the woman mumbles, and looks out the window. A bit later, she told me that many of the locals “are unhappy” but didn’t want to elaborate; she seemed nervous about casting Rabaul in a negative light. Tourism collapsed here following the eruption, and it appeared that foreigners were still a relatively uncommon sight on the island. Wherever we drove, people would smile, wave, even sometimes call out at the sight of us. Though Nautilus has yet to attract the international-scale attention of other trailblazing extraction projects, it’s already plenty divisive. Locals may be concerned about foreign operations entering PNG waters and the threat to its environment, but environmentalists worldwide are beginning to organize around the issue, too. Protests against the Solwara-1 have already been amplified by a nascent global movement seeking to halt deepwater mining outright. One opponent of the project is Richard Steiner, a marine conservation biologist who formerly taught with the University of Alaska. Steiner has studied marine disasters ever since the Exxon Valdez unfolded in his backyard. I first met him years ago: He was one of the first experts to arrive on the scene of the BP spill in 2010, where he helped monitor and analyze the fallout of the disaster. Today he spearheads a nonprofit called Oasis Earth, and lends his expertise to various conservation efforts. 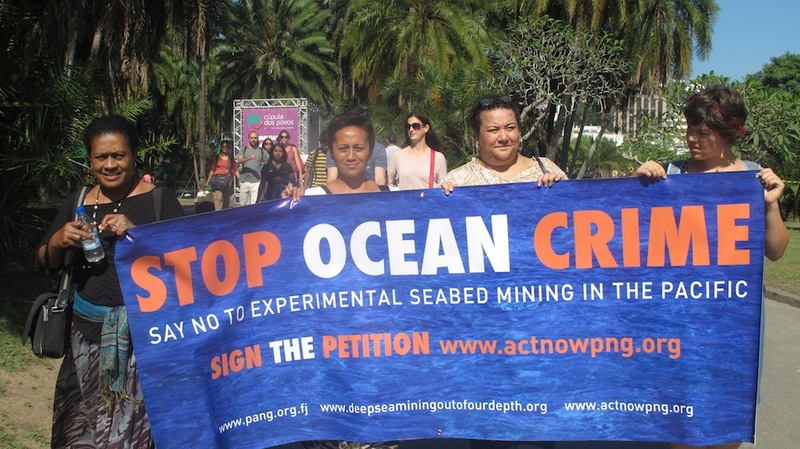 The Deep Sea Mining Campaign, which he supports, was organized to slow the drive towards mining the deep, and, in particular, its highest-profile poster project. The full impact the project will have on the deep sea environment is difficult to discern. Nautilus commissioned a US environmental consulting nonprofit, Earth Economics, to carry out an environmental assessment of Solwara, which cast it in relatively favorable light. But Steiner and other critics have called its subsequent report misleading, and charged that it fails to take into account myriad ecosystem services and marine life vulnerabilities. Nautilus, of course, insists that its plans are not only safe, but even safer than the alternative. On-land mines are major polluters; leaching and runoff can contaminate watersheds and soil, create sinkholes, and encourage logging and development. They can endanger the health of those living nearby. With deep water mining, that’s less of a problem. Still, conservationists argue there are other ways to obtain copper without succumbing to the deep. The biggest question, of course, isn’t just the dangers of Solwara-1. It’s whether this project may kickstart a wider industry, in places not as thoroughly vetted. “Korea and Japan are both active, a company called Neptune is also an active player right now,” van Dover says. Indeed, in recent years, Korea has successfully tested a deep sea mining robot, and Japan has approved leasing rights in its waters for seafloor mineral exploration. A lot of eyes will be on Nautilus. Meanwhile, construction on its hulking Production Support Vessel, the ship that will serve as the above-sea command center, has begun on schedule. In October 2015, Nautilus CEO Johnston celebrated the milestone by saying that “Our objective remains to develop the world’s first commercial high grade seafloor copper-gold project and launch the deep water seafloor resource production industry,” he said. “With the eyes of the world waiting to see the dawn of this new industry, we look forward to taking delivery of the vessel in December 2017 to enable us to commence our seafloor operations in Q1 2018.” He reaffirmed the same to me. Nautilus released images of the finished machines recently, and earned a small but muted round of press, which shared the photos of the impressive-looking deep sea rovers. “The final component of the seafloor production system is the vessel, which represents the critical path to production. Steel cutting for the vessel has begun and we are confident of its delivery at the end of 2017,” he said. The rest of the onboard equipment is complete, too, he added. So the robotic drills are set to drop. Even if Nautilus has taken every conceivable step to promote good practices within its operation, to understand the ecosystem it will be exploiting, and to communicate with concerned parties, questions remain. It may seem a utopian demand for Steiner and his peers to ask that we attempt to live sustainably with the minerals currently in circulation instead of drawing them out of the sea, but we’re also on the precipice of a bold precedent. Few will likely advocate for the deep once the mining begins. Van Dover glances out the window of our cabin. The choice is to destroy other forms of life so humans can live a bit longer by consuming without limit, live modestly and limit population or go the way of the dinosaurs.